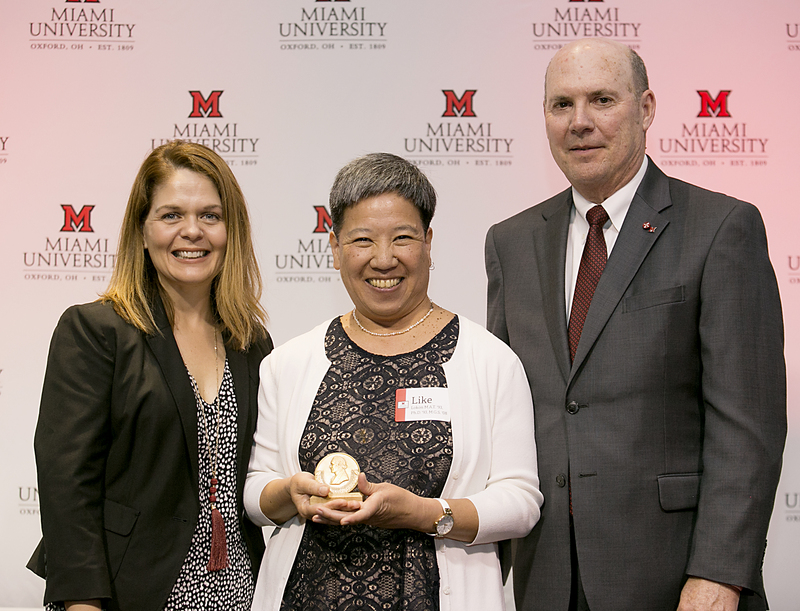 Opening Minds Through Art’s (OMA) founder and director, Elizabeth “Like” Lokon, was honored this year with Miami University’s Bishop Medal. This award is presented to individuals who have distinguished themselves in service to humanity and named after Miami’s first president, Robert Hamilton Bishop. When asked what providing service to humanity means to her, Like stressed the importance of impacting both older and younger generations involved in OMA. One goal Like has for OMA students is to create active, engaged citizens no matter what path they take after graduation. Like’s methods of service work are centered around the arts, which according to her, offer the “opportunity to use imagination, to break the rules, be creative, experiment and play.” Play is an important concept for Like, she emphasizes that it doesn’t stop when you get older. Regardless of one’s abilities or age, the arts can offer an opportunity to play. The Bishop medal is a tribute to Like’s achievements in making connections across generations, improving lives through the arts, and promoting lifelong play in all of us. For those who may not know where to begin with service work, she recommends websites such as createthegood.org and volunteermatch.org, or check out the OMA website (ScrippsOMA.org) for sites near you that always welcome volunteers.